No matter what area your business focuses on, The Physician Payments Sunshine Act will greatly impact your direct-to physician sales & distributed marketing strategy. With new regulatory requirements for tracking, reporting, and planning marketing expenditures, corporate marketers now need faster, more effective methods for the development, production, storage, fulfillment, and distribution of marketing assets and promotional materials to their distributed salesforce and channel partners. With the challenges of broader territories, less face-time, and greater regulations, how can you successfully provide marketing programs, materials, and fulfillment services to support your sales reps and distributors? Look no further. 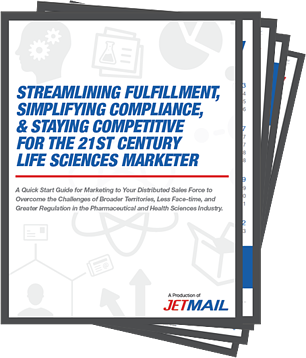 This free ebook shares tips, tricks, and best practices recommendations on implementating, managing, and optimizing a marketing fulfillment program to support your direct sales strategy with Sunshine Act compliance at the forefront. Drawing from real-world experience, we developed this educational guide to help corporate marketers tackle some of the biggest challenges they face in today's life sciences marketplace. Simplify Sunshine Act compliance for direct-to-physician marketing campaigns. Control corporate brand identity across distributed sales teams and channels partners. Reduce obsolescence & inventory-carrying costs associated with literature fulfillment. Enable brand-compliant, local customization and delivery of field marketing materials. Improve marketing communications for individual prospects, across specialties, and in local markets. Minimize inefficiencies related to versioning advertising creative for local markets. Empower your distributed sales force with a robust, scalable marketing supply chain program. Learn how to manage brand compliance, improve speed to market, and engage your target markets while gaining full-transparency into local marketing activities. When it comes to distributed marketing, we’re the experts. Take the hassle out of marketing fulfillment and sales force support. Grab your free copy and start optimizing your marketing fulfillment and direct sales strategies for success.